Langdale is a valley in the Lake District and is the collective name for Great Langdale and Little Langdale which are separated by Lingmoor Fell. Great Langdale is best known for the Langdale Pikes which are a group of peaks on the northern side of the dale. The area is popular with hikers, climbers and fell runners who are attracted to the many fells at the head of the valley and Scafell Pike, which is England’s highest mountain, can also be climbed from here. The valley is U-shaped formed by glaciers and its mouth is located at Skelwith Bridge. The valley houses two villages Chapel Stile and Elterwater and these were the centres of the Lakeland slate industry. The workings at Elterwater Quarry and Spout Cragg Quarry are still working now using modern methods and both are operated by the Burlington Stone Company but many other mines have now fallen into disuse. Little Langdale valley is a hanging valley and has been heavily mined for copper and slate for the last few hundred years but today only the evidence remains. 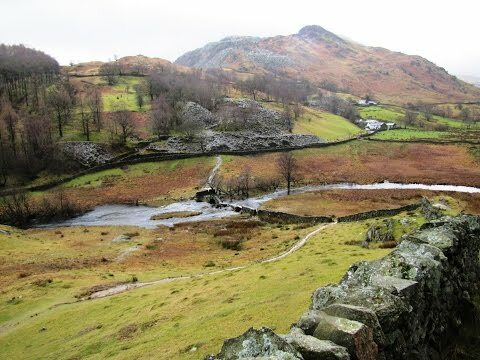 Little Langdale was in earlier days at the intersection of packhorse routes and Slaters Bridge which crosses the River Brathay at Little Langdale Tarn is a fine example. The bridge built of slate is of 17th century and crosses the river in three spans supported by a large mid stream boulder and stone causeways. Little Langdale Tarn which is a natural tarn set in a marshy area of the valley was several times larger at the end of the last ice age. The tarn, which has no public access, and a large area around the tarn has been designated an SSSI and is managed by the National Trust who also maintains many of the scattered farms in the valley. Little Langdale village is a small hamlet consisting of a few stone houses and a pub, the Three Shires Inn it was named this because it was only two miles from where each of three old boundaries of the counties of Cumberland, Lancashire and Westmorland met. Skelwith Bridge is another small village situated by the River Brathay near Wrynose Pass and the slate that was quarried in the area in the 19th century was mainly used for roofing but was also used for lintels, tombstones, signs and paving. The village houses a pub the Skelwith Bridge Hotel, the Kirkstone Galleries which is a converted Bobbin Mill selling home products and has a cafe and Chesters shop, bakery and cafe. Skelwith Force situated on the River Brathay is only a few minutes walk from Skelwith Bridge. The force is low in height but is very impressive after heavy rainfall. Colwith Force which is further down on the River Brathay drops about forty feet in several stages is also very impressive after heavy rain. We park in the lay-by just on the edge of Chapel Stile and walk forwards on the road into the village passing a weir and a footbridge we can see on the left. After a look round the village we return to the footbridge we saw on the left now on the right and cross over it. We turn right and walk between the wall and the River Brathay and keep following the path through Burlington slate quarry. We come to a track and a building on our right here we turn right and then take the path on the left opposite the side of the building and head uphill through the wood. We cross straight over the next track and keep heading uphill on the path still going through the wood. At the end of the wood we come to another track with a wall in front of us here we turn right, go through the gate and follow the track and the footpath sign to Little Langdale Tarn. We pass through Dale End farm and follow the tarmac track until we come to a road. We turn left onto the road then immediately right and follow the track to Little Langdale Tarn and cross over Slater Bridge (footbridge) and up the other side and then turn left onto the track. We follow the track and turn right just after a bridge and take the path on the left sign posted Coniston 4 ½ miles via Hodge Close. We follow the track round to the left which becomes a tarmac track we cross over a little bridge and keep going uphill, and then it bears to the left again at Stang End (an old farm) we then follow the footpath sign for Colwith and Skelwith. We keep following the tarmac track until we come to a building end (High Peak) here we go through the gate on the left and walk between the buildings on the bridle way and go through another gate into the field and follow the well marked path. Then at a sign post we take the left fork downhill to Colwith Force. After admiring the force we keep heading forwards on the path until we reach the road and the bridge. We cross over the stile and turn right along the road for a short way and then after another small bridge we turn left and follow the path, the river is on our left. After a short way we head up some rather steep steps and then start to leave the river. We walk through the buildings of Elterwater guest house and Park Farm and keep following the track to the right of Park House. We keep following the track and then take a left fork. When we reach a sign post we turn right to Skelwith Bridge on cycle route 37 and go over the river and through a gate to the road and then turn left to go over Skelwith Bridge. (Optional: Just before the bridge we take a path on the left to Skelwith Force on the left side of the river and then return back to Skelwith Bridge). After crossing Skelwith Bridge we turn left, the river on our left, and follow the path slightly to the right past Edna’s Holiday Cottages and by Kirkstone Galleries on the right. We then turn off left to view Skelwith Force on the other side. We then go back to the track and head forwards through the open fields with the river on our left. We follow the river round to the left to Elterwater, the lake, and keep following the track going through a wood until we reach Elterwater village. At the National Trust car park we turn left over a little bridge and then immediately right and follow the tarmac track with the river and Elterwater village on our right. We keep heading uphill until we see a quarry entrance on our left and we take the footpath opposite and follow the footpath sign back to Chapel Stile 1/3 of a mile. We walk back over the bridge and back to our parked car. This is an easy to moderate walk with some good level paths and a few moderate inclines and declines. Chapel Stile is in the Langdale Valley of the Lake District. There is free parking in a lay-by near Chapel Stile and there is a pay and display car park in Elterwater. From the A591 Windermere to Keswick road, take the A593 at Clappersgate then take the right turn at Skelwith Bridge, the B5343, and follow the road by-passing the village of Elterwater to Chapel Stile. There are public toilets at Chapel Stile open from Easter to October and at Elterwater near the car park and bridge. For refreshments in Chapel Stile there is Wainwright’s Inn, Brambles Cafe and Langdale Co- operative village store. In Little Langdale village there is the Three Shires Inn. At Skelwith Bridge there is the Skelwith Bridge Hotel and Chesters shop, bakery and cafe. In Elterwater there is the Britannia Inn and the Elterwater Inn. I followed the directions of your walk today and it was fantastic. Thank you so much, I thoroughly enjoyed the walk in some pretty miserable weather conditions. The paths were flowing let alone the rivers and waterfalls. Thank you again so much from an Australian visitor on his first walk in the Lake District. I followed the directions exactly and they were perfect.